1982; 355 pages. Edited by Ted Hughes & Frances McCullough. Genre : Non-Fiction. Overall Rating : D (but see last paragraph). After immensely enjoying The Bell Jar, I picked this up with the idea of getting a better understanding about what drove Plath to her suicide attempts. Alas, TJOSP sheds little light in that regard. There is now an "Unabridged" version of this book, so this particular edition is rendered essentially superfluous. And it needs to be kept in mind that I'm sure Plath never intended these musings to be shared with the general public. This book was heavily edited by Plath's "quasi-ex" Ted Hughes, and her mom, with whom she had a complex love-hate relationship. One gets the feeling these two (especially Hughes) did some significant cutting to make themselves look good. For instance, there is nothing here about the "Bell Jar" breakdown years (allegedly, those journals just up and disappeared). There is nothing negative about Hughes here at all; and there is nothing here about the final months of Plath's life, after she and Hughes had separated due to his infidelity. 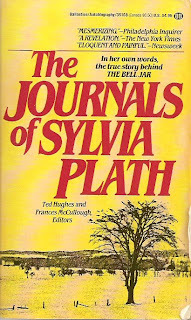 (Hughes admits destroying the final two of Plath's journals). What you do get is an open and often unflattering self-portrait of Plath. She has caustic comments about almost everyone she meets (although she finally breaks this habit in the last 30 pages of the book). She also is jealous about her authoring "rivals", especially when they get published before she does. And she is vain about her looks, considering herself to be a sort of disdainful man-eater. Plath also seems to have set her life goals unattainably high. She is determined to be the best author ever, and anything less than that causes grave self-doubts, insecurity, and bouts of depression. In college, she fears that she'll get trapped in a 50's marriage that will squelch her writing goals. Ironically, she marries Hughes who, for whatever his personal drawbacks, was a brilliant poet/writer. Plath "praises" his successes, but one gets the feeling her teeth were gritted when she wrote those entries. "If only a group of people were more important to me than the idea of a Novel, I might begin a novel." (pg. 320). "Feel unlike writing anything today. A horror that I am really at bottom uninterested in people : the reason I don't write stories." (pg. 324). "The wind has blown a warm yellow moon up over the sea; a bulbous moon, which sprouts in the soiled indigo sky, and spills bright winking petals of light on the quivering black water." (pg. 31) Oh my, That's beautiful! Perhaps it might be said that Plath's real strength lay in being a wordsmith. She struggled her whole career to create plots for her marvelous prose. Even The Bell Jar, her magnum opus, is more an autobiography than a novel, and therefore needed no plot. I suspect that she is best-suited as a poet, not a story-writer. We shall see. Ariel is sitting on my TBR shelf. In conclusion, I struggled to complete this book. Thank goodness for OCD. I can't recommend TJOSP to most readers; I got tired of Plath's endless verbosity about writing, editing, submitting, re-editing, rewriting and re-submitting all the poems and stories she worked on. However, those at 5-Squared who are writers might rate this book much higher, even moreso if they can relate to Plath's bipolarity. I'd be a little worried about delving into Plath's journals, firstly because it feels like an invasion of privacy, secondly because they were so heavily "edited" that I'm not sure how accurate they'd be anyway, and thirdly because I've read bits of journal entries in the Johnny Panic collection and I didn't particularly enjoy the musings in there. Plath wrote very differently in her journals and not in a way that I liked much. On the other hand, journals are so private, it's hard to think that they should be read at all. One writes the strongest of feelings in a journal, you know? Kafka was the same way - all his negative feelings got poured into his journal, and the editors said to bear in mind that he didn't feel like this most of the time, that he used his journal to get out the stuff he didn't want to say to people aloud. I imagine it's somewhat the same with Plath. yep, i think Hughes & Mom were just trying to make some $$$ off of the public's craving for anything written by Plath. i think there's some monumental irony here too. Ted Hughes certainly had a successful career, and by all accounts was the more gifted writer of the two. yet they're both gone now, and it's Plath who we will remember. I'm not sure if it was $$ oriented or if perhaps the public was clamouring so much for her journals that they had to put out something. I've never read Ted Hughes. I don't read poetry. But I know some people would argue with the statement that his work is better than hers. Hughes was Enlgand's poet-laureate for 14 years, and was much more successful at selling his works to magazines than Plath. but would that have changed after The Bell Jar was published, and if Plath hadn't committed suicide? hmmm. at any rate, being more successful does not necessarily mean he was a better writer than Plath. poetry is a particularly subjective thing. my impression from these journals was that Plath was a slow-learner when it came to sending the magazines "what they wanted". she kept writing and sending what her muse inspired her to write. noble, yes. but prone to being rejected.